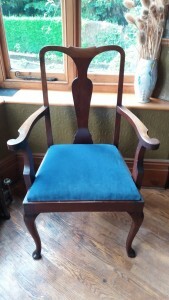 Vicki Towndrow from Ecclesall, Sheffield asked us to traditionally upholster three antique armchairs for her new home. One chair was an Edwardian drop-in seat armchair, the second a Victorian pin-stuffed armchair and the third an antique, can backed nursing chair. 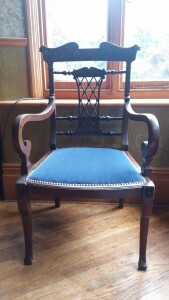 Vicki’s nursing chair required re-springing and completely re-upholstering (see photographs below). 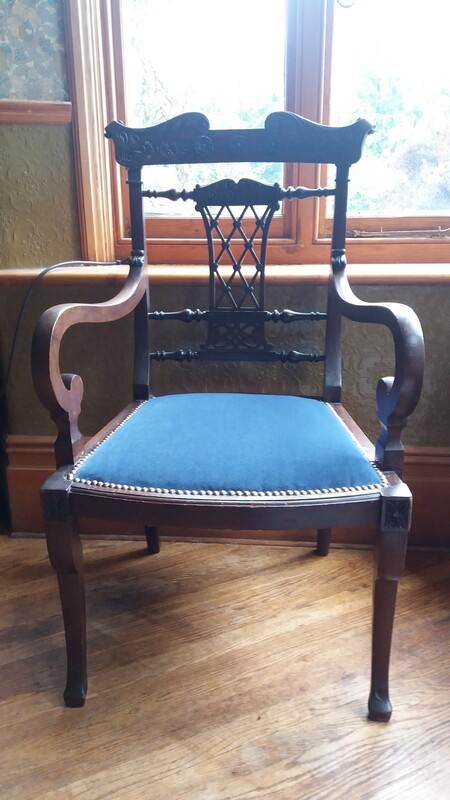 The frames on the other antique chairs were stripped back and the woodwork was lightly cleaned and polished in order to preserve the original finish. Vicki chose a beautiful, stain resistant velvet fabric from Linwood in a gorgeous Atlantic Blue colour which really brought out the colour of the wood. We highlighted the velvet blue on Vicki’s pin-stuffed armchair with French Natural decorative nails, which we applied individually, by hand. If you have similar chairs which you are considering having upholstered then please contact us for a free, no obligation quote.